When vacationers and thrill seekers want a fun place to get away, Orlando, Florida usually tops the list. The city is known for warm weather and an abundance of amusement parks. However, it is also known for being an expensive city where you can pay top dollar for everything. Even so, if you are traveling on a budget, it is still possible to enjoy everything Orlando has to offer. The closer to the theme parks the hotel is, the more expensive it will be. Downtown Orlando offers hotels that are just a few miles up the interstate from the theme parks, but at discounted prices. Kissimmee is another popular town just outside of Orlando that offers less expensive hotel rooms. Another advantage to staying in Kissimmee is that it is a short drive to the Kennedy Space Center and the beaches of the Atlantic. The Orlando Magicard is a free discount card you can order online or pick up at the visitor's center. The card offers discounts on dining, shopping, entertainment, and lodging throughout the Orlando area. Also, if you plan on visiting the theme parks, research ticket prices ahead of time. Often, you can purchase tickets online before your trip and save money. More inexpensive entertainment can be found at Universal City Walk when it lights up every night with dining, music, shopping, and entertainment. You have to pay for parking, unless you are a Florida resident. Then, parking is free after 6 p.m. with valid identification. Like most other tourist destinations, summer is peak season in Orlando, and that is when prices will be the highest. Holidays and spring break are also times when crowds are heaviest. July and August will be the hottest months, while hurricane season stretches from June to November. That being said, late spring and early fall are usually the best times to visit Orlando. During these months, the weather is decent and the crowds are not overwhelming. Whenever you decide to go, make sure you pack your sunscreen. Even in winter, the sun is strong enough to burn skin and ruin any vacation. If you are traveling with children, keep an eye out for free meal specials specifically for them. Many hotels and restaurants around the area will offer these deals on certain days of the week. Additionally, if you plan on visiting the theme parks, arrange to eat your meals outside of the park. Food prices are often significantly higher in the parks because they know they have a captive audience. For example, if you have a large breakfast before you enter the park, a small lunch inside the park, and then a large dinner once you leave the park, you can save a lot of money on food expenses. 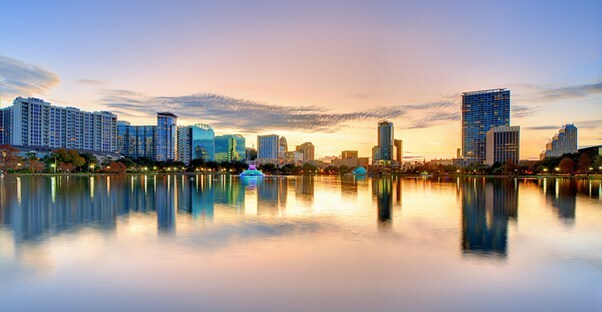 As one of the most visited cities in Florida, expenses can add up quickly in Orlando. However, if you plan accordingly, you can make your visit enjoyable without blowing your budget.